Certain types of businesses need the right kind of garage doors to make them accessible to customers, delivery people, and other types of visitors. Whether you own a warehouse or an auto repair shop, you need a fully functional commercial garage door. 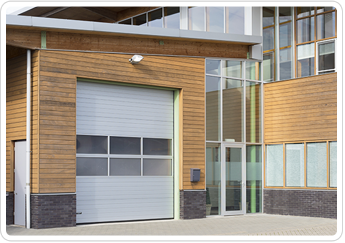 The one piece, sectional, and roll up styles are the most common commercial garage doors. Like its name suggests, the one piece garage door is a solid door that swings out and up to open. A sectional door operates in the same manner as a residential garage door, using tracks and springs to open and close. A roll up garage door, also called a coiling door, is typically made of steel and it rolls up into a neat coil at the top of the door. For a quality selection of commercial garage doors in Frisco, TX, call Discount Garage Door Repair. We carry a full selection of products that are suitable for all types of businesses, so make us your choice when you want a new garage door. We also offer commercial garage door repairs. We think that the reason customers keep coming back to us is because we both sell and install the doors you purchase from us. You never have to worry about doing the work yourself or hiring someone just for the installation service. We provide complete commercial garage door installation. To make sure that your door fits, we measure the opening where it will go. Then we follow a step-by-step process until all components are in place. We finish by opening and closing your commercial garage door to make sure that it functions like it should. Your durable and weather-resident door is designed to serve you for years. Extend the life of your overhead door with commercial garage door service from our technicians. Although your door is tough, it will probably become defective over time due to regular opening and closing. A damaged door won't necessarily have to be replaced. We may be able to make some simple repairs that will fix the problem and prevent you from having to buy a garage door. To prevent premature aging, we recommend you request commercial garage door maintenance service. We'll inspect the door to identify any areas that show signs of wear. So that your door continues to operate optimally, we replace parts and make adjustments. Contact us for commercial garage doors that make add value to your property. We proudly serve Frisco, Plano, Mckinney, The Colony, Prosper, Aubrey, Lewisville, Little Elm, and Allen, TX and the surrounding areas. Ask About Our Current Specials & Discounts!